I've never found making macarons easy - and while I managed to make them as part of a group lesson, I had rather less success when trying to make them at home. I'd even tried making them from an expensive packet mix, which cost £7.50, so when I saw that Sainsbury's had introduced a new macaron packet mix costing only £2, I knew I had to try it. The instructions are very easy to follow and you only need a couple of ingredients beside what is included in the packet - they even give you a piping bag. First you have to whisk two egg whites to stiff peaks. Here are the two packets of mixture, one for the macarons and one for the filling. Simply mix the macaron packet mix into the whisked egg whites. It's a very bright pink colour and has a zingy raspberry taste but is also quite sweet. The instructions say to pipe the macarons onto a piece of greaseproof paper on a baking tray but I decided to use my macaron mat. It has two sizes of circles marked out (on the back and front) to use as a guide and is made of silicon so it's easy to peel the macarons off when they are cooked. There's a paper piping bag included in the box. I was a bit dubious but stood the bag in a tall glass so I could fill it, and snipped off a little piece at the bottom. I was pleased to find that the macaron mixture was quite thick so didn't start running out of the piping bag until I was ready. I found it quite easy to pipe the macarons onto the marked circles - definitely easier than the last time I made macarons where my discs were all shapes and sizes (even using the mat, as my mixture was quite runny). Bake in the oven- the instructions say to put the macarons into a cold oven and turn it to 50C for 20 minutes, then turn the oven up to 150C ( I think - don't quote me on that) for another 15 mins. That was different to how I've made them before; I also put my silicon mat onto a baking tray to keep it flat, and banged it on the worktop a few times to eliminate any bubbles, something that wasn't in the instructions but I've been taught to do. They came off the macaron mat very easily and many were almost perfect circles with only a few that had spread. To make the filling, I whisked the packet mixture together with some butter. It's pink and has a zesty raspberry taste; it's also a good consistency - not too thick, not too thin. However, I didn't quite have enough to sandwich all the macarons together (and I don't think I was particularly heavy handed with the filling). 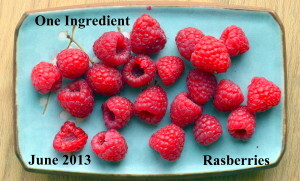 I had some leftover raspberry puree I had made from a punnet of raspberries that I have been eating in a breakfast fruit pot I've made so I mixed this with some icing sugar to make some more filling for the macarons. It was very easy to sandwich the macarons together and the filling stayed put and did not run out. For some reason though the macarons had lost their pink colour and turned more brown on the outside - mine always seem to do that, I wonder why? The inside is a lovely bright pink though! I decided to package these up in a small box and send to a friend for his birthday. I hope they made it in the post OK! I'm sending these raspberry macarons to Alphabakes, the challenge I co-host with Ros from The More Than Occasional Baker, as the letter we have randomly chosen this month is R.
Raspberries are the ingredient for this month's One Ingredient Challenge, hosted by Nazima from Franglais Kitchen and Laura from How To Cook Good Food. I saw this mix in Sainsbury's and was half tempted to buy them. The macarons look great - I'll have to give it a go next time. Lovely AlphaBakes entry. Well done Caroline, Macarons are so unpredictable that I have given up on them but perhaps I shall give another go. Raspberry ones are particularly yummy in my opinion so I hope your friend enjoyed their present!